I've been mostly playing with starter clubs for the past few days in preparation for Tough-It-Out III. One of the most frustrating things about it is the damn starter putter. I don't like the 30-foot minimum scale, and I also was beginning to think it was costing me a lot of putts just due to general crappiness. How awful is it? 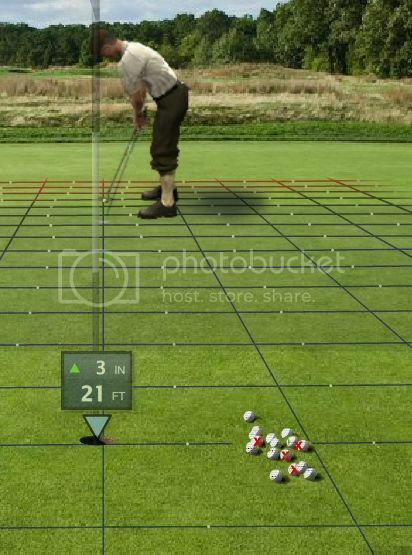 Thanks to the new mulligan feature, we are now able to repeat the exact same putt as many times as we can tolerate. I tested three putters in my inventory - the starter, my usual L77 Nike, and the L55 Daytona. For each putter, I found a mostly straight, slightly uphill putt using Tournament greens on Bethpage #10 of around 20 feet. This allowed me to use 18 feet of power for all three - 60% of the 30 foot scale for the starter and Daytona and 90% of the 20 foot Nike scale. I placed the tip of the aimer at the intersection of grid lines 2 feet to the right of the hole in reverse view. I mulliganed and mulliganed until I had 20 dings from the exact same spot. I took a screen capture of each dinged result. I then pasted each screencap into my trusty Paint Shop Pro as a new layer. The screencaps lined up exactly (none was off by even a pixel). I then used the eraser tool to uncover the ball locations from previous putts on the background layer, and merged the layers. 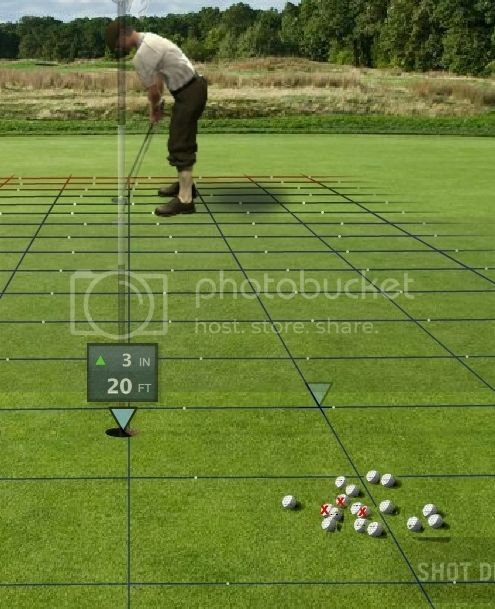 The result is one image of all 20 putts. If a result was within half a ball width of a previous putt, I marked the location with a red X. There is probably some error in the meter strength input. I tried my best, but was probably off by a tiny amount every now and then. I think +/- 3 or 4 inches of distance is about right. Now for the results! The starter really is really bad. Given perfect reads, you'll make less than half of your 20-footers with it. The Daytona and Nike are both a little worse than I thought they'd be. It looks as though around 25% of the time, a perfect read will still result in a miss from this distance. The Nike looks a little better than the Daytona, but I don't think the sample size is large enough to state that as a fact. What a great concept for a test, and a wonderful exploration of what the mulligan feature can offer! You've certainly proved how challenging the starter putter is. Anecdotally, I've always felt that luck played a significant part in any rounds with less than 30 putts, and had many times when I was sure a dinged putt was destined for the cup, only to get a nasty surprise (and I didn't need to be 20 ft away for that to happen, lol!). It also makes our champion golfers' achievements in starter-gear tourneys all the more impressive: for instance, I'm still stunned by Gary (Woodoworkery's) consistently high total distance putts made with the starter putter in the last edition of TIO (see stats here). In a sense, playing with the starter putter replicates the conditions of a major even more, as this degree of random result is almost akin to the pros dealing with the vagaries of spiked-up greens or unsufficiently-repaired pitch marks. I just re-read 'The Greatest Game Ever Played' about Francis Ouimet's titantic battle with Harry Vardon and Ted Ray for the 1913 U.S. Open, and was stunned to come across the passages describing how they had to deal with balls that plugged in the greens (and not be allowed to lift them out! ), and no rule in place allowing balls to be marked and cleaned, thus having to putt with mud stuck to the ball. I guess it's all a matter of perspective, but reading that history made even the WGT starter putter experience more tolerable! A great effort and a great result! In my eyes, the Starter putter ain't all bad, about 40% more spread in width and almost the same result in length variation. Nike a tad better in width spread than the Daytona. Of course the Starter is not a precision putter for a Legend, but not too bad for a beginner (different to the SWING putter). Also stunning, even more stunning to me, is the difference in absolute length. The Starter seems to be 2 ft longer (one square) than the others, and Nike is a tad (0.5 ft?) shorter than Daytona. This eliminates my opinion that all putters would putt with the same length - wonder what a test with different balls would show? Great experiment and results bh!! Since you aimed at the same spot each time it appears the Daytona pushes its putts to the right. Or could that be due to slightly different starting positions? One thing I wasn't clear about is that while the group for each putter is a repetition of exactly the same putt, the line for each putter's group is different from the others. It appears that I managed to get the exact same reverse camera view for all three groups. I can tell this by the way that the flagstick lines up with objects in the background. I wish that I would have noticed this when doing the test! I probably could have gotten the starting points to within a few inches with another set-up putt or two. As it was, the starter is a foot and a half closer to the hole than the Daytona and a couple of inches to the left (reverse view). The Nike is a couple of inches behind the Daytona and almost 2 feet to the left. The aim point for the starter was farther back, making the line more to the right. I included this aim point in the image. The Nike and Daytona aim points were both at the grid intersection to the right of the hole. You can read the break by the dots on the grid. They were moving right to left (reverse view). I let them move for a few seconds before grabbing the caps. It looks like the Daytona was grabbed a second or two quicker than the others. I really should have timed them so that they'd all be the same (another thing to remember next time). They also might not be consistent because the horizontal lines are in different places. Anybody who uses chip view on Merion knows what I'm talking about here. The Nike's putts didn't break at all...maybe an inch. And they shouldn't have. 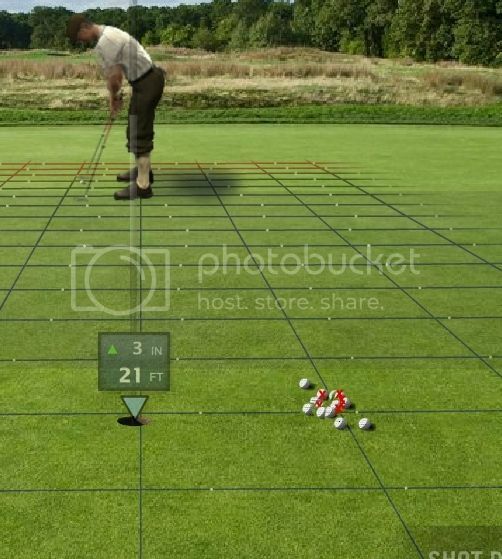 It has to do with the putt line being more off-center to the grid than the others. But this is a topic for another thread, one I've been meaning to get around to for the past 6 months. The distances were very consistent. All three putters sent the ball 21-22 feet. It's worth noting that the starter spread looks a little bigger than it really is if you don't account for the fact that it's closer to you. It's still a much larger spread than the premium putters. Very interesting insight. Thank you! Fantastic stuff bhoese. Good test methodology. And showing the ending positions for each test group on one screen tells us everything we need to know about the results. Thanks for "putting" the effort into this and sharing the results! Good work here. This is the new standard in testing. To further this test, i would like to see the odyssey and max putters results. Would be nice to see similar tests for all clubs, in one place. perhaps flight path snapshots from replays for the clubs with ball flight. - maybe a website idea? i'm sure u could line up the hits from WGT'rs shopping for sticks and stones.